What I bought from Inglot / Gee Whiskers! I needed to replace my blush brush and decided I'd try out one from Inglot - I won't lie, the main reason I went there was because I've never actually ventured into the store before because I've been fearful of the amount of money I would spend. But I thought I'd be brave and test my self control - so run in pay and reluctantly run out. First off, the Canal Walk store is really amazing! It's filled with so many beautiful products that are bright and colourful and everything is displayed in such a way that the store is almost like a candy store. Needless to say I was very much filled with the excitement of a child in a candy store but the reality is that I don't have Mommy or Daddy paying for everything so I had to control my spending. And I tried really hard to only get a blush brush but I then asked myself, "How can you buy a blush brush and not get a blush to go with it?". So off to the blush counter I went to make my selection. One thing I really liked is that the sales assistant could pick up that I knew what I wanted and that I wasn't there to browse around so she didn't harass me to buy other things (I know that if she had I would've caved and spent way too much money). The face blush brush that I bought is a natural brush that retails for R319. That is the most I have ever paid for a make up brush but I wear blush often and thought I'd treat myself to something decent. The bristles are super soft and pick up the blush powder effortlessly. When brushed across my cheeks the powder transferred easily, hardly leaving any product on the brush. The handle is made of wood and the bristles are goat hair (Honestly, I wasn't too thrilled when I found this out after I had made the purchased and already used the brush). I haven't experienced any shedding from the brush and it's been easy to keep clean. It is rather pricey but I can see this brush lasting me a few good years before needing to be replaced so I think it's money well spent. I chose a matte blush in shade 55 because I like the blush on my cheeks to look more natural. However, I was very drawn to the beautiful pink and peachy blushes that had shimmer in them (there are 9 colours to choose from). The blush has a silky, soft feeling to it and what I really love is that when applied to your skin it almost tends to soak in and stain the cheeks, giving it a more natural look than something that is just sitting on top of the skin. It is also highly pigmented meaning that you only need a light dusting on your cheeks to get a nice glow to them. When I tested this out on my finger in the store I struggled to remove it with a tissue so I knew this would last incredibly well throughout the day, and it hasn't disappointed me. I paid R179 for the compact which is a little more than what I have paid before for other blushes, but this blush is larger in size and lasts better than the Bodyography and Body Shop blushes I had been using. For makeup basics I think Inglot might become the store of choice for me - granted I haven't really tried out stores like MAC that are specifically catered to professional makeup. Next on my to-get list will definitely be a purple Colour Play Mascara because I've been dying to test it out but just never been brave enough to venture into the Inglot store...but I think it's obvious to say that my fear has been overcome. Follow Inglot on Twitter and Facebook. 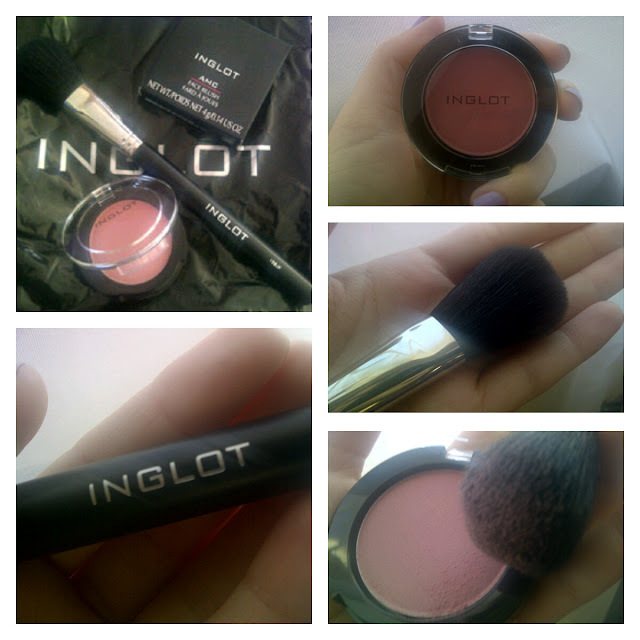 If you don't have an Inglot store near you, visit their online store where purchases over R500 gets you free delivery. Thank you so much :) Send me the link to your blog, would love to check it out. You are welcome to pop me an email if you have any questions. I am not a blogging expert - but I'd be happy to assist you with any questions you might have. My second day of work was WAY better than my first day. Once I get a desk and PC and access card I'll be happier :P I seriously miss no internet access during the day!